Thanks to caring people in the United States, Canada, and the United Kingdom, thousands of displaced children in Iraq received some Christmas joy this year. On December 10, Samaritan’s Purse airlifted 60,000 shoebox gifts to be distributed to Yazidis, Christians, and others who fled ISIS during the summer. In addition to the shoeboxes, Samaritan’s Purse has been working for months to get warm clothing, winter jackets, blankets, socks, shoes, and heaters to thousands of displaced families to help them survive the winter. Fifteen-year-old Philip and his mother Shedha fled the predominately Christian town of Qaraqosh in August when ISIS came. They now live on the second floor of an abandoned building in Erbil. Philip was delighted to attend an Operation Christmas Child shoebox distribution hosted in the small open area in their building. 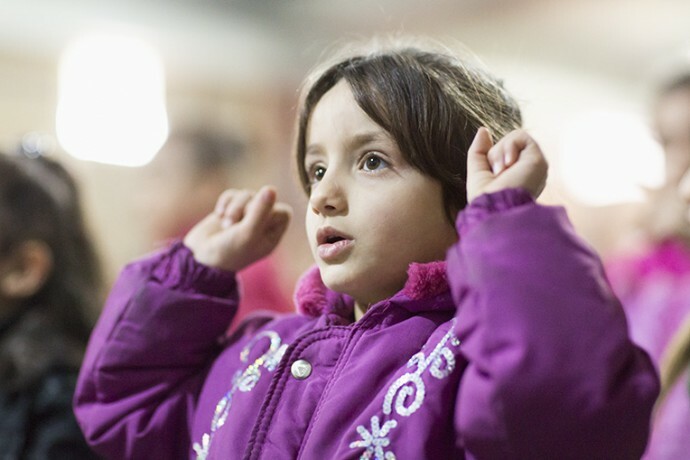 A young girl celebrates during an Operation Christmas Child distribution in Erbil. Packed full with children and adults who cared for them, the room overflowed with excitement as the children listened to a Bible story and sang some Christian songs. Anticipation filled the room as the shoeboxes were passed out. Philip opened his box to find many gifts, his favorite being a blank book that he can use for journaling or drawing. Fourteen-year-old Basil lives with his family of nine in the town of Enishke outside Dohuk. They made a home among other Yazidi families in an abandoned building that was once used to store Saddam Hussein’s military supplies. Yazidis are ethnic Kurds who follow a religion that blends Zoroastrianism, Christianity, and Sufi Islam. Basil and his family spent nine days without food and very little water when they fled from ISIS. When ISIS came, his family began the two-day walk to Mount Sinjar. Basil’s father Ismael and the other men traveling with them did not continue very far. He said, “We returned to the village with guns to protect our homes.” When Ismael arrived, he was disheartened to find one of his neighbors serving as a guide for ISIS. The gas station and market that Ismael owned were locked before they fled. Soon ISIS began calling his number, which they’d found posted at the businesses. They asked him to come and open his stores. Even though the calls came every day, Ismael refused because he knew it would cost him his life. Eventually Ismael returned to the Yazidi holy site of Mount Sinjar where ISIS surrounded more than 40,000 Yazidis. They stayed on top of the mountain nine days in which time water had to be dripped into babies’ mouths because it was so scarce. During this period, Ismael’s brother was shot three times by ISIS and died. His father also sustained a bullet wound in his back. When the Peshmerga, the Kurdish military force, opened the road off the mountain, Ismael and his family were loaded onto a big truck and taken to Syria. There they received food and water before being taken to northern Iraq. “I am afraid very much for the future of my children,” said Ismael. Still, Basil has aspirations. “I hope when I finish my college to be a teacher for children,” he said. 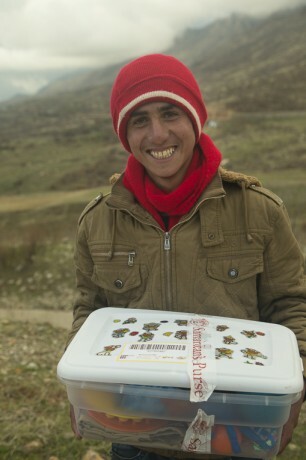 A displaced Yazidi boy shows off all the treasures in his Operation Christmas Child shoebox at his home in an abandoned chicken farm. 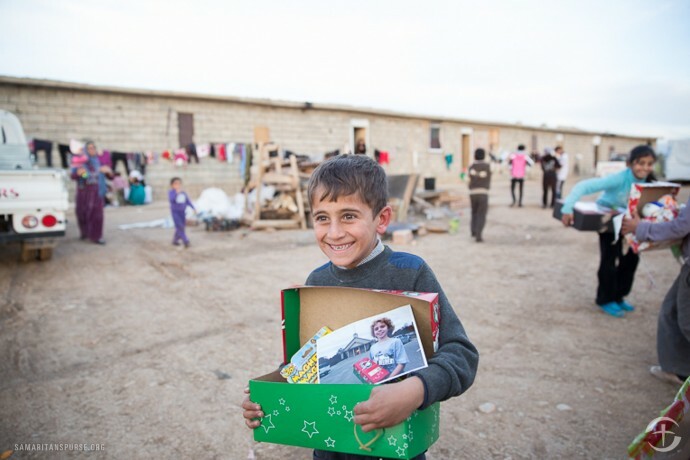 Samaritan’s Purse airlifted 60,000 shoeboxes to children in Iraq who have been displaced by ISIS violence. Some of that help came in the form of an Operation Christmas Child shoebox distribution. The gathering with 125 children was intended to extend hope and let kids be kids. An Operation Christmas Child leader from the Middle East shared a Bible story and taught the children a song before the gift-filled shoeboxes were passed out. On the count of three, the children opened their boxes simultaneously.